Am I the only one who tends to compare how much I like a person with how much I like a fabric I will be sewing with for them? When Beetle’s baby quilt arrived, I was blown away and touched on many levels, not the least of which was my beautiful friends had sewn with one of my favourite fabric ranges, which I’m led to believe actually came from AJ’s personal stash, and I know how hard it would have been for me to part with for anyone other than the very best of friends. I had a few choices, when picking fabric for this little project out of my stash. And stash it had to be, because in the rush of end of year, I had only realised at 9.30pm the night before, that not only was this particular group finishing up for the year TOMORROW, but it was also our teacher’s last day after 8 (!!) years, so I wanted something special, and pretty, and when my eye landed on a yard of Kate Spain fabric, I knew what I had to use. Anyone who knows me, and my fabric preferences, knows what a testament this choice is to our appreciation for her. Fabric in hand, I took to my Pinterest bag board, and found this little cutie. With the addition of some cute stationery I had on hand for emergencies such as this, I thought it would make a great little clutch that could do double duty as a pencil case & a “teachers care package” to farewell her from toddler music as she heading into full-time school-based teaching. The zip was slightly too short, so I added a little bit of contrasting fabric left over from the Kate Spain charm swap, to bring it up to length, and used the same fabric as the bow band. I may or may not have shared this particular late night spiral into last minute sewing insanity on Instagram, and with some other night owls to cheer me on, had the clutch together in just under an hour. Hey hey, thought I, it’s still not Friday, I have an hour, so why not make a matching tea wallet to slip in with some TimTams to really round it out. 15 minutes later I was merrily stuffing and wrapping and forgetting to actually write the card I had mentally written in my head. 10 points to me. As well as our teacher, she is also a friend, and my last minute slash late night sewing adventures are somewhat of a running joke between us, and the irony of the fact I started her gift at around 10pm is not lost on me. Nor her, apparently, since as soon as she opened it, almost the first thing she asked was how late was I up sewing. It would seem I have a reputation!! And well earned, I suppose, since Saturday night it hit me we would see a teacher-friend at church the next day for the last time before Christmas, who I also wanted to give a little gift to. Guess who found herself sewing another little clutch (from Simply Colour fabric this time, another firm favourite!) not quite as late on Saturday night? It’s such a sweet clutch though, and really quite easy to make, so I’m tempted to whip up a few and pop them in the gift box for “just in case”…ok, or not. We all know that I could never be that organised. With one full week of school under our belt, we are hitting our stride & 2015 is playing along beautifully. A few little projects (and a couple of bigger ones) are in varying stages of progress. Routines are being set & books are being read & cpretty things are being made. And best of all the weekend is here ready for us to kick back and enjoy – but first, I’m going to need to show Friday who’s boss. Shouldn’t be too hard to do that, and find a sneaky five minutes to craft, right? Right? Yep. Let’s play pretend and say that’s what will happen. Happy Friday!! 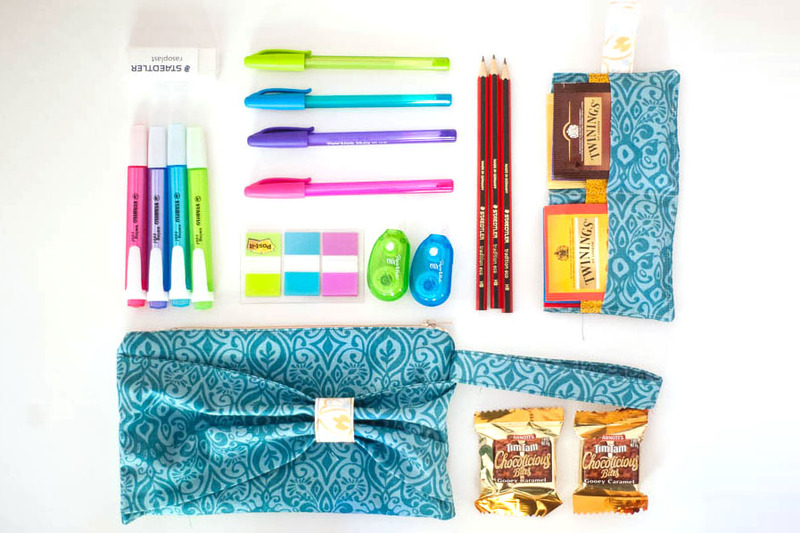 that little pack of stationary goodies is an awesome addition to the cute pouch! Where did you get the highlighters from? Am in need of purple and blue but they need to be small 😉 you know how it is when it has to be the correct size and all!